Jaguar XJ: in detail | What Car? No one will be able to accuse Jaguar of living in the past this time. When the company replaces its flagship XJ saloon at the end of this year, it will mark the end of the 'gentlemen's club' era of big Jaguars. Instead, you'll see a fresh, modern, innovative car that progresses the modernisation process that began with the mid-range XF. The mostly aluminium, riveted underbody structure of the current XJ continues largely unchanged, but now it's wrapped in a new alloy shell that will make you gasp at the extent of change. The newcomer also gets the latest V6 diesel and V8 petrol engines and chassis electronics already in use in the XF and the XK ranges, and in-car gadgets to match anything found in the German competition. The front is dominated by a larger, more upright version of the XF's rectangular grille. There's also a huge windscreen that blends into a glass roof stretching as far back as rear passengers' heads, leaving just a slim aluminium panel that Callum likens to the flying bridge on luxury yachts. The sides are clean and mostly unadorned, apart from the 'Jaguar'-monogrammed gills behind the front wheels, and small swage lines above the sills. Once again there will be standard and long-wheelbase versions, both fractionally longer, wider and lower than the outgoing car. 'Our aim was to make it leaner and more sleek,' says Callum. It's the rear end that some people might find contentious. The screen is edged with black panels that disguise the width of the roof pillars, while the short, steeply angled boot lid is flanked by vertical LED lamp clusters that turn onto the rear wings. It's unlike anything we've ever seen from Jaguar. So is the interior. There's still plenty of wood and leather, but they no longer make the cabin look like an Edwardian drawing room, and they're integrated with totally modern instruments and controls. 'Virtual' 3-D dials deliver essential information, a TFT (thin film technology) screen allows the driver and front passenger to view different things at the same time and a touchscreen 'media hub' provides access to a full complement of entertainment, communication and navigation features. 'We wanted to make it unforgettable, with seductive design and intuitive controls,' says chief programme engineer Andy Dobson. As in the XF, Bowers & Wilkins provides the high-end stereo, but here it's a new 1200-watt, 20-speaker Dolby 7.1 surround-sound system that the car was almost designed around. The aim was to deliver unrivalled in-car sound quality. Jaguar says that in this class of car, high performance is now the minimum price of a ticket to the dance. The big-on-power, low-on-weight XJ certainly delivers on that score. In western Europe, the most important engine will be the V6 diesel. This is the efficient new 272bhp 3.0-litre 'S' unit slotted into the XF a few months ago. 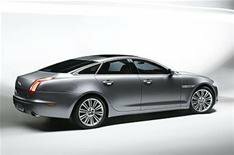 Factor in the weight savings that result from an all-alloy body (Jaguar reckons the XJ is between 160 and 250 kilos lighter than any rival) and you'll also have the lowest-CO2 luxury saloon on the market. You'll also be able to get the 381bhp naturally-aspirated and 505bhp supercharged 5.0-litre V8s introduced earlier this year, plus a new 465bhp version of the supercharged engine. The chassis is largely the one that was developed for the modernised XK range introduced a few months ago, but there are air springs at the rear of the XJ to keep the car level regardless of load. All models will have continuously variable damping and supercharged versions have an active differential to give them a handling edge. A six-speed automatic gearbox is standard, controlled by the rotary gear selector first seen on the XF, and there are shift programmes for winter and performance driving. The new XJ will make its motor show debut at the Frankfurt motor show in September, exactly two years after the debut of the XF, and it looks capable of giving executives from rival German companies a similarly uncomfortable day on home territory. If test driver Mike Cross has done his stuff as thoroughly as his colleagues in design and engineering, the Brits may just have put one over the Germans again and there'll be no risk of it losing out in a penalty shoot-out. They're not going to like this at BMW or Mercedes-Benz.